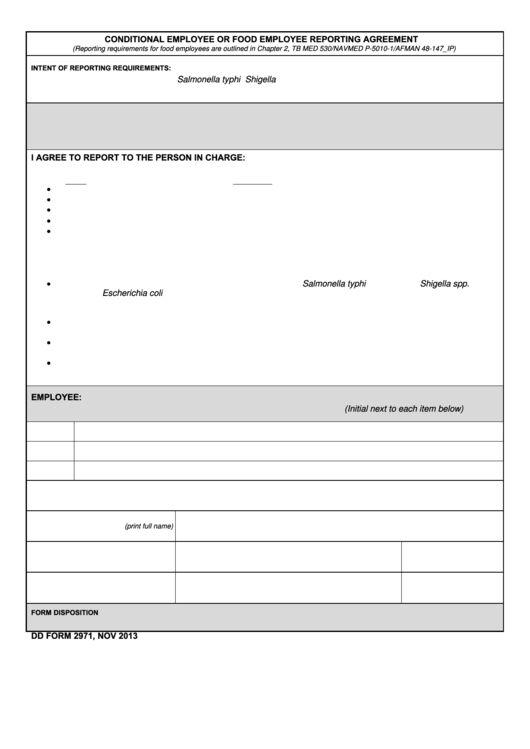 Download a blank fillable Dd Form 2971 - Conditional Employee Or Food Employee Reporting Agreement in PDF format just by clicking the "DOWNLOAD PDF" button. Complete Dd Form 2971 - Conditional Employee Or Food Employee Reporting Agreement with your personal data - all interactive fields are highlighted in places where you should type, access drop-down lists or select multiple-choice options. (STEC), or Hepatitis A virus. steps to preclude the transmission of food borne illness. skin abrasions or cuts, regardless of size. Whenever diagnosed as being ill with: Norovirus; Typhoid Fever (Salmonella typhi); Shigellosis (Shigella spp. infection); Escherichia coli (E. coli) O157:H7 or other EHEC/STEC infection; or Hepatitis A virus infection. E. coli O157:H7 or other EHEC/STEC infection, or Hepatitis A.
Typhoid Fever, Shigellosis, E. coli O157:H7 or other EHEC/STEC infection, or Hepatitis A.
establishment that may jeopardize my employment. Retain this document on file until employee termination, transfer or detaching from this facility.